Quickly find, organize and process the assets you need to create the content that matters to you. Share files with others in one click for efficient communication. Take control of your workflow. Automate often-used image processing. Batch process assets and their metadata. No experts required, you are the expert now. Automate common operations: metadata application, image processing, file transfers and much more. Export metadata to third-party systems. With all the power of FotoStation Pro and a Client Access License, FotoStation Client makes the perfect workstation for teams Understand what are the key functions of FotoStation Client with a short whiteboard animation. Or book a demo and we will assist you in getting the solutions that is right for you. With FotoStation Client you can create, organize and manage your digital collections. With its strong focus on automation and batch processing, keeping metadata in check, displaying usage rights and managing licenses has never been easier. Rate images, classify them according to preference, set their status using colored markers - however you prefer to work, FotoStation has a way that suits you. Your team and your partners will clearly understand how your photos may be used. Organizing them increases their value - they become true assets. Use industry-standard XMP metadata to describe your files in a way that’s meaningful to your team. Pre-define metadata values for quick captioning. Automate application of any metadata, such as usage rights, credit and copyright information. Build your own metadata specification if you wish, so it works precisely how you want it to. Create reliable and powerful workflows by combining processes in Actions to create the output you want. Apply these workflows on demand for individual files or folders, or in larger batches.Let FotoStation Client do the work for you. 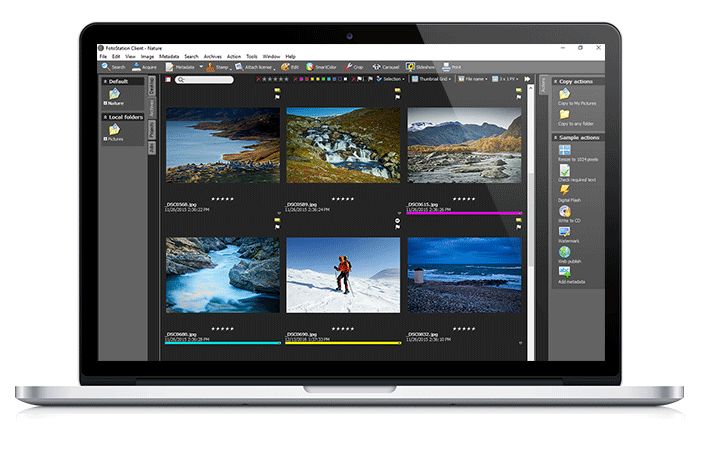 Work faster by converting file formats, resizing and watermarking images, adding copyrights and much more in a single click without leaving FotoStation Client. It really is that quick! Quickly add licensing and usage rights information to your images. Apply copyright information and take control of model release forms. Use markers - visual indicators - to see which images are ready to go and which require additional work. Use Actions to easily transfer a whole selection of pictures via FTP or HTTP, or to share files via email. Once it’s set up, it only takes a click. Create custom slideshows. Apply watermarks to safeguard your work. Add images to your documents and spreadsheets directly from FotoStation. Export metadata records for use in external systems. FotoStation Client integrates with Index Manager to handle millions of assets, including PDFs and Microsoft Office documents with astonishing indexing, search and retrieval performance. Keep all your assets close at hand, at all times. Do you want explore FotoStation right now? A 14-day free trial for FotoStation for a Single User is available to download, try right now! FotoStation Client connects with Index Manager to unleash all the power of the FotoWare Client/Server system. Get in touch with one of our experts to explore your options.